Has called in Pittsburgh, Seattle, Nova Scotia, New Jersey, and Martha's Vineyard. Adult colonial dance classes for centennials of Granby, Ellington, Windham, each culminating in a demonstration. 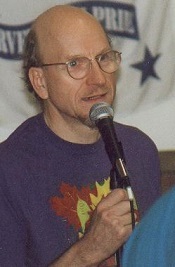 Founder / director of Reel Nutmeg dance troupe 1979 to 1990. Senior citizen and adult line dance classes ongoing in five towns. Are you looking for entertainment for your community festival, company picnic, or church social? Jim Gregory can deliver. Do you require a live string band and caller for your wedding celebration? Jim Gregory is ready to arrange it for you. How about a dance sequence crafted for the school kids' history or phys. ed. program? Great idea — let's get on it! 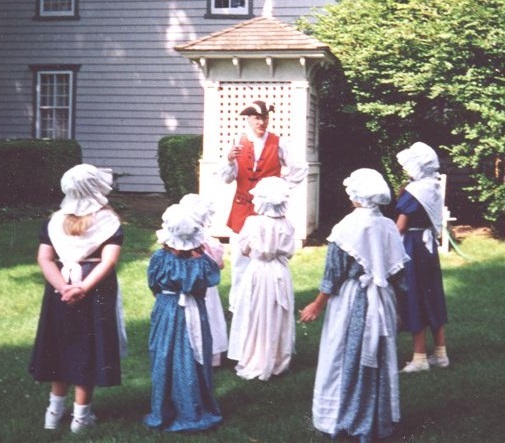 Dancing fun is a hit at fairs, birthday parties, and colonial camps too. Let's use our imaginations. Maybe it's private dance lessons you really want. For example: swing, tango, waltz, or country-western. When Jim Gregory takes you through the steps, you will know what you are doing. We can use recorded music to make it most affordable. Jim Gregory of West Hartford, CT, works with bands from CT, MA, and NY. So most of the Northeast is within their accustomed range of travel. The private lessons are available more locally, from Central CT to Springfield, MA. When you contact us we can talk over rates and dates. Throughout each week Jim's line dance classes for senior citizens continue in five Connecticut towns. Lively Minds is his discussion group at the West Hartford Senior Center. By the end of October, a similar group may be added to the weekly Wethersfield classes. The newest venture is the Monday night series at Vinnie's. It seems that Middletown has a truly community-oriented group there, in possession of a good dance floor. Thanks, and I hope to be seeing you. December 8 "Hannukah square dance" at Temple Emanu-El in Providence. December 1 New Haven contra dance with New Haven jammers ban where we celebrated the "dance anniversary" of Rob and Marsha. November 24 Called a barn dance at Newtown Town Hall for home schoolers and their parents. Music by Reelin' Away. November 10 Called the HCD contradance in Old Wethersfield accompanied by Wild Card. November 3 Everyone had a great time line dancing at Waterbury's American Italian Civic Club. October 18th and 25th Residents enjoyed a line dance showcase at The Village at South Farms, Middletown, CT. I involved enthusiastic staff members in my performances. October 14 All had a fine time line dancing at an anniversary party in Providence. Saturday October 13 Had a great time leading Early American dance for the Barkhamsted Historical Society at their Tavern Night. JIgs and reels provided by Heartsease. October 1 Was joined by Kris, a Vinnie's class member, to perform line dancing at Mitchell College in New London. August 19th I taught and led country line dances with the band Southern Voice at the Tournament Players Club in Cromwell, CT. Fun at Pinewoods Family Week I shared my calling on Campers' Night, performed a mambo and sings Smoke Along the Track. Next week off to Martha's Vineyard to lead squaredancing at Camp Duarte! June 2 Taught square and line dancing to Girl Scouts at Camp Yankee Trails. June 1 My third time leading line dance party kicking off "Manchester Pride" week. April 14 Led a line dance party with a D.J. for the Mansfield Seniors Club. April 7 Travelled to St. Mary's Espiscopal church in Manchester to teach and call the Family Contradance with the Wild Notes. Saturday April 7th Whitneyville Cultural Center. I called a wedding party dance with the Fiddleheads. March 6th Mansfield Middle School. Taught and called barn dances with student orchestras. February 12 and March 12 taught tango and waltz and tango and waltz line dances to Shoreline homeschoolers. December - Duncaster Retirement Center to celebrate a 90th birthday party with a square dance. Music by the Jane Rothsfield Family Band. December - I was at the North Granby Grange leading line and square dancing at a holiday party. November 24th, line dancing was the featured surprise for the delighted bride at a Jack and Jill party in East Haddam. All bridal party members joined in and had a great time. November 25th, called contras for the Round Hill dancers (Stamford) with Contrapositive. Great fun for beginners and experienced dancers alike Cornwall Dance Squares, Circles, & Contras Saturday, November 4) with music by: Still, The Homegrown Band Sat. Oct. 6 Called at Quiet Corner Contradance with Bill Walach and Dave Howard. Oct. 4 Led country line dancing for the volunteers at Foodshare in Bloomfield. Sept. 9 Sept. 1 Main Street Stroll in Middletown. Demo'ed line dance classes at Vinnie's Jump and Jive. Always happy to contribute to this event. Senior Dance, 6:00 to 9:00 p.m. at the Senior Center, 549 East Middle Turnpike. Music and line-dancing, with caller Jim Gregory. No experience needed and you do not need to bring a partner -- all welcome! Refreshments and door prizes. Karaoke during the break. Admission is free but tickets are required to be eligible for door prizes. Tickets available from mid-May to June 2 at the Senior Center and at the Customer Service area at Town Hall, 41 Center Street. Young people encouraged to attend and learn dance steps. Enjoy the fun of music, dance, and socializing. Busy weekend leading dancing at Solair Camp and Camp Hazen. Called at the Granby Grange last Friday night. Taught a line dance class to youth for Middletown Parks and Recreation. Was happy to help Bethany Covenant Church in Berlin, CT raise money for their mission trip to Ecuador by leading line dancing at their dinner/auction. Gave line dance demo and bodhran lesson for Middletown families through Recreation Dept. 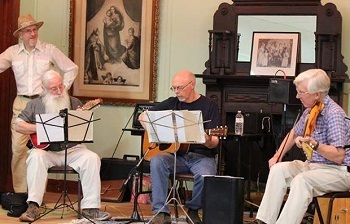 Contra/barn dance at North Granby Grange with Heartsease. Adult country western line dance classes through Middletown Recreation Department. Rockland County New York Contra called with the Gotham Gals. Busy day yesterday! Led line dancing in eastern CT in the morning and led contras and squares in Cornwall in the evening! Taught country line dancing in Brooklyn CT in the morning; later that day called a public square dance in Cornwall that evening with Still, the Homegrown Band. Halloween Fall Festival on Middletown's South Green. Led children and staffers in my own choreography to Werewolves of London, Monster Mash, Addams Family and Ghostbusters. Taught basics of contradancing to an adult education class in Windsor. Led country line dance party for the Simsbury Newcomers Club, with six of my students assisting. Then drove to Wallingford to call square dancing for students at Choate Rosemary Hall. Led country line dance party for members of the Essex Yacht Club. Called squares and reels in Litchfield for the installation celebration of the choir Joyful Noise. Traversing the state again. Called an afternoon family dance for campers at the Incarnation Center in Ivoryton. Then drove cross country up to Wolcott: led partygoers in country line dance to celebrate a woman's milestone birthday. Led country line dancing to the band Whiskey and Rye, at a fundraiser for the Newtown Scholarship Association. I brought two of my students as ringers for this "Beer, Bourbon & BBQ" gala. Called the season opener at the Quiet Corner Contradance. A fun time in Coventry, with Stacy Phillips and Dave Howard playing the music. Brought eleven of my students to Covenant Village in Cromwell. Led them and residents in an introductory line dance class. Led three classes of students in square and circle dances at the Goddard School in Glastonbury. Led country line dance session for Nelson's Family Campground in East Hampton, CT.
Called squares for a bluegrass family birthday party in Branford. Led Southern Squares and line dances for enthused students taking a "Road Trip Across America", for the ASPIRE Youth Summer Program. We met in Norwalk, but our "visit" was to Tennessee. Called for the public contradance in Smithtown, Long Island. Happy to travel by ferry. Led line dance sample lessons at Vinnie's Community Dance Day in Middletown, CT. Led a line dance party for young and old as part of Manchester Pride Week (CT). 1974 was the year Jim hitched his star to the dance band wagon. In that spring semester at Cornell Jim finished up his studies of philosophy and enjoyed his first evenings with the Cornell Folk Dance group. By May '74, attending a country dance weekend at Hudson Guild Farm, Jim was hooked. Returning to CT, he sought out folk, English and contra dances. Live music was not easy to find around Hartford, however. By 1978 Jim had started his own dance series that grew into two contras per month with live fiddle bands. Hartford Country Dance was born. There would also be twenty years of lovely summer evenings in Elizabeth Park at the Concert & Country Dance series. Jim called the majority of these, but he hired guest bands and callers, too. Jim has been a performing dancer/choreographer with several groups totaling about 33 years experience. Counted among them are Sedenka (the International dance performers), Mountain Laurel Cloggers, Reel Nutmeg as founder and director, Crackerbarrel Revue, and the Elm City Vintage Dancers. These experiences were recounted in Jim's column "Your Contra Corner," which ran 1982-1985 in Folknotes. In 2003 Jim was featured as the dancer/actor with members of the New Haven Symphony. Jim became a full time dance teacher and caller in 1980. Senior citizen classes and school programs form a steady part of his day's work. Adult classes, contras, and weddings enliven the evenings and weekends. Jim has developed specialties in family dances and colonial American dance. Camp Salomon hired Jim full time for a 10 week summer and that relationship continued three more summers. Jim has also been on the staff at Rowe Camp's Liberation Week and Pinewoods Camper's week. He has called at NEFFA, NOMAD, and the Dance Flurry. Jim was the stage choreographer for two Connecticut musicals, Robber Bridegroom and Best Little Whorehouse in Texas. In addition, half a dozen of his original contras are in print, including Zesty Contras, Fiddler Magazine, and the Country Dance & Song Society News. Jim continues to create country line dances and New England contras. The Family Dance is accessible to the whole community, especially children bringing adults. Enjoying dances such as Virginia Reels and squares, snakes circles, and trios makes for energizing, interactive fun. Your Wedding Dance will be a memorable way to celebrate your marriage. We add waltzes, polkas, and mixers to the repertoire of the family dance, then choose something especially for the newlyweds. The dancing not only entertains the guests, but also provides them a way to participate, mix & mingle. Fiddle tunes are the pleasant background. A New England Contradance is a lively evening involving the general public as well as experienced dancers. This contemporary dance form (with a great history) builds both the body and the community. You'll love the live music. The Concert & Country Dance program adds up to a full evening of music, song and dance. A performance of folk songs by a star singer or band leads it off. Then comes country dancing, with the humor and calling of Jim Gregory. This mini-festival can top off your community event. Each subject can be taught in a series of two or three 40-minute workshops. Your series might culminate in a student performance. Choreography and calling practice can be added for further enrichment.